I have been anxious to run fast to see how I am progressing. This morning I had that opportunity. My run workout was to run 4 x 5 minute intervals at my desired half marathon race pace with a three minute recovery between sets. After a mile warm up I set the treadmill at 5.8 (10:20 per mile) and stared my five minutes. This pace would equate to a 2:15 half marathon. I noticed a two things as I ran. First my foot pod was recording my pace faster – 9:50 per mile. It is calibrated to the GPS and my stride, so I tend to believe it over the treadmill. Second, regardless of 9:50 or 10:20 pace, I felt good. For all four intervals too. My heart rate stayed in my high zone three, not crossing my AT. My run workout this morning truly was a turning point for me. I have seen assessment results indicating I am improving. A few runs have shown I could run faster based on my heart rate. But today it all came into alignment. I have not felt this good, this confident, about my running before. Ever. Yes, there is always room for improvement. But for today I am celebrating. Gone are my doubts, the voices in my head that I should give up, and the comparisons to others. This is my little slice of celebration today. So many things in life are out of our control. People will disappoint us, outcomes sometimes are not what we want, and frankly some things aren’t fair and people can be selfish and mean. I have no control over any of it. But I can control my mind’s focus, my attitude, and where I choose to align myself. I choose to focus on the good, not waste my time on toxic things, and BELIEVE in improvement and the talents I have been blessed with. And I have friends who encourage me, what could be better? 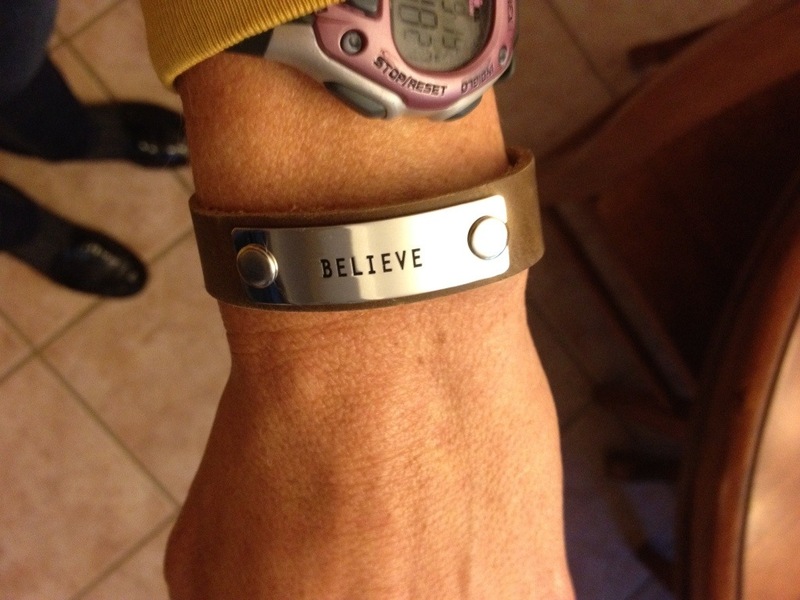 On that note – here is a picture of a bracelet my friend gave me. She also did the Rev3 half (rocked it too) and was in the picture with me in front of the semi. What a wonderful reminder.